Companies of all sizes are adopting cloud-based services, such as Microsoft Office 365, as a way to give their end-users greater flexibility and easier access to core business applications. This requires corporate IT departments to reexamine their current data security posture, including Data Loss Prevention policies to better monitor and control sensitive data that are being created in the cloud, traversing from endpoint devices to cloud applications, and vice versa. 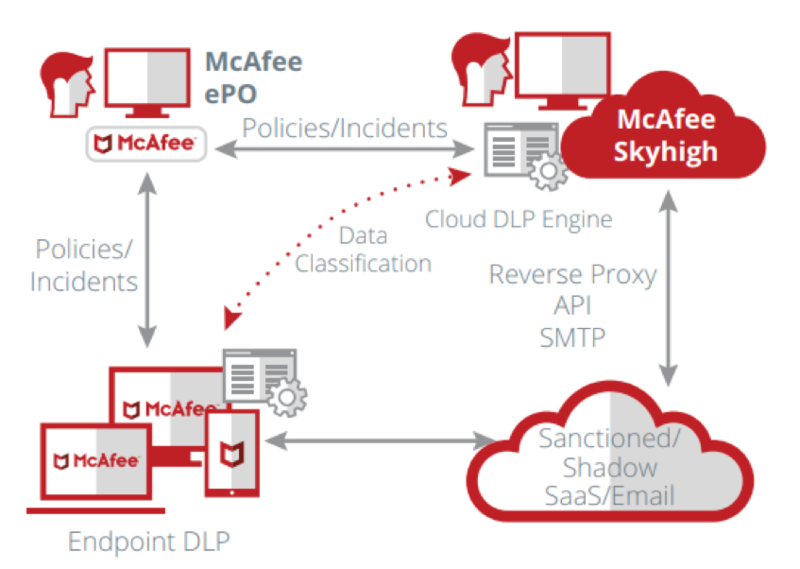 With the latest integration of McAfee Endpoint DLP and Skyhigh Security Cloud, existing DLP customers can easily extend current enterprise DLP policies to the cloud via the McAfee ePO console. Connecting the two solutions can be as easy as one click and as fast as under one minute. Consistent data protection policies will be created to protect the data, whether it is residing on the endpoint, being shared via the network, or traversing to cloud applications. This is done via the McAfee ePO console by sharing the on-prem DLP classification tags which help define cloud DLP policies. These tags are available out-of-the-box. With the McAfee ePO console, you have a single pane of glass management experience. DLP violations can be viewed in McAfee ePO whether the incident is from an on-prem device or a cloud application. With the integration, there are additional benefits you can gain including real-time activity monitoring and threat protection against Shadow IT, the ability to identify anomalous behavior using Cloud data, integration with McAfee® Global Threat Intelligence to inspect cloud data, along with out-of-the-box policy templates based on business requirement, compliance regulation, industry, cloud service, and third-party benchmark. The post The Top 3 Reasons to Integrate DLP with a Cloud Access Security Broker (CASB) appeared first on McAfee Blogs.